Mashed potatoes are one of my favorite things to eat on Thanksgiving, but this year since I am pregnant and on a really strict low carb diet (for my diabetes) real mashed potatoes are out (bummer). I recently started researching alternatives to some of my favorite dishes because there is NO way my plate will be without a big ole pile of mash potatoes. I came across this recipe that uses cauliflower instead of potatoes. Hmmm not a big cauliflower fan so I wasn't sure. If there is a choice of either celery or cauliflower in a veggie dish 9 times out of 10 I will choose the celery. BUT I decided to give it a try since the reviews were outstanding. 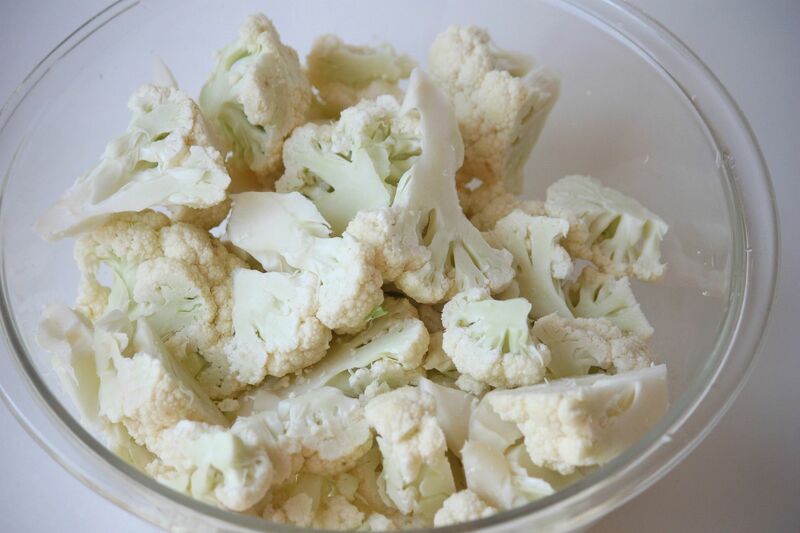 Wash and cut cauliflower into small pieces. Boil in a pot of water for about 10-15 minutes or until soft and cooked. Drain and dry using paper towels. Immediately place in food processor or blender. You do not want the cauliflower to cool. 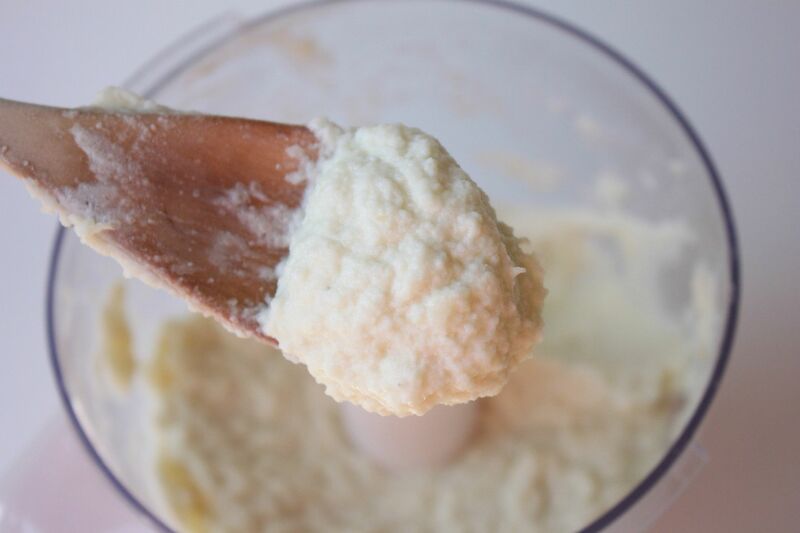 Puree the cauliflower with the cream cheese, Parmesan cheese, garlic, salt and pepper. Sprinkle the top with chives and a few dashes of pepper. Serve! These were seriously unbelievable! I will definitely be making these for Thanksgiving. They were creamy and smooth, just like mashed potatoes should be. Such a delicious alternative... plus you don't need to feel guilty if you go back for seconds or thirds since they are virtually carb free! This is also a great side dish to bring if you still plan on making the real thing. Okay, I am going to have to try these! I never even knew skinny and mashed potatoes could be in the same sentence but I think I like it. I've been eating mashed potatoes this way for years now and I couldn't imagine going back to the traditional ones! I've been wanting to try this for awhile now. You always inspire me to cook so many different things!! Now the question is, will it fool my husband? Ha. probably not…but oh well. I'm gonna do it anyway! i think if you didnt tell anyone... no one would know ! sounds really interesting and yummy! I've heard so much about califlower mashed potatoes! I'll definitely be trying them. I didn't know you could make mashed potatoes from cauliflower! What!? I am super excited about this recipe. My Memories Digital Scrapbook Giveaway! I'm a carb whore for sure, but I love me some cauliflower and this sounds delish. I've seen it a lot mixed with potatoes for a mash, but I don't think I've seen it straight cauliflower. I'm tryin' it. You should try it roasted too! The taste is nothing like steaming it. Have you had mashed parsnips? AMAZING!!! Seriously, you should check those out too if you're off the potatoes for awhile. I definitely am going to try these!! Thank you! I have made these before and was shocked at how they resemble the real thing! I think I will sneak these on my families Thanksgiving table this year! Have a great day! what an amazing alternative! ah! I have never tried there but they look delicious! LOVE it, you can fool your kidlets too. Wow this is so awesome. I need to lose 10 lbs so I need to cut back on carbs so I am definitely going to give this recipe a try. They look just like the real thing. I might offer this for thanksgiving this year and not tell anyone after it is all gone. LOL. I'm going to have to try these! They sound so good! Thanks for sharing!! YUM! I've always wanted to try this! What a great idea! I love cauliflower and will definitely try these! Yeeeeuuuuumm! Skinny mashed potatoes?? I would love to give this a try. I am so glad you are finding things that will work with your strict diet. It's all going to be worth it when you have your sweet, healthy baby here! OMG!!! i looove cauliflower! i am going to make this what a great healthier alternative!! i've actually made these before... and i love them too! such a great alternative! I've seen recipes for "mashed potatoes" using cauliflower, but I still have never tried them. My husband doesn't really care for cauliflowers, so I wonder if he would eat them this way. I'll have to really try this recipe! My cousin made me a similar recipe a little while ago, and I agree, they are the best mashed potato alternative out there! Thanks for posting the recipe, I've been wanting to make a batch for myself! I've made this before - it is soooooooo surprisingly good. Even my parents, who are the definition of "meat and potato" eaters, LOVED them. I have issues with dairy so I used light mayo instead of cream cheese and it was still creamy with a little kick. that recipe looks amazing and definitely skinny mashed potatoes and i bet no one would be able to tell the difference! Wow this is seariously great! I make these, and I LOVE them. Never even liked cauliflower before this dish. Yum. I actually love cauliflower! My sister makes some kind of cauliflower with alfredo sauce that is fantastic. I will have to try this recipe out! Wowzers, I'll have to give this a try! Hi Lindsay! It seems like ages since I've commented on one of your blog posts. I'm sooooo so busy over here. I'm having a combined pirate birthday party for the kids this Sunday plus end of school and Kindy is approaching plus the weather is warming up etc etc. No rest for the wicked, hey? Just wanted to say that cauliflower is one of my favourites. I also do it as rice. Just chop the floret part really finely, boil and serve as you would rice. Great for a low carb alternative. Hope your morning sickness is subsiding? I've made this before as a South Beach Diet recipe. Even my husband found it to be enjoyable. Quite surprising! love finding other mommy bloggers. :) following you and on twitter, too! So funny that you're talking mashed potatoes. I saw in blogland yesterday the question "What's Thanksgiving without mashed potatoes?". My response was "Huh?". I've NEVER heard of having them on Thanksgiving. I did a poll on Facebook & all of my northern friends have them but only 2 southerners. I thought that was interesting. Anyway, I'll be trying this recipe. It sounds delish & I really like cauliflower. I've been making mashed cauliflower for a while now because they are sooo delicious. I use goat cheese instead of cream cheese, they are to die for!!!!! Yum! These look delish! Adding it to my recipe to-do list! Made these for the first time tonight & I usually never comment on these recipes but WOW, these are WONDERFUL!!! I was skeptical at first but I just can't say enough good things about this dish! My boyfriend loved it just as much as I did! Forget regular mashed potatoes... I'm never going back! Thanks for making my night, I am going to share this with everyone! I made these tonight! Yummy! Definitely hit the spot! Thanks for sharing!! Oh! I added a bit of butter and cheddar cheese.. I loved it! These are wonderful, however I don't know if I would call them "skinny". They are low-carb but one does have to keep the fat content of the cheese in mind. Awesome, awesome recipe though. I must say that I tried these tonight and I am in heaven... I have been trying to lower my carb intake and these fit the bill.. I do however have one question, How many servings are there in this recipe? Since I am diabetic (type II), I must eat low carb choices. My wife does this recipe with some real mashed potatoes mixed in. I haven't tried this in a blender, though. Thanks for the tip! Since I have been on the Dukan Diet I have missed potato, and this sounds like an awesome alternative, thanks! Goodness, just stumbled onto this recipe by accident but going to have to try this now! I haven't had the best luck with boiling & mashing cauliflower. I might be too impatient. I'm so happy right now! Tried this for the first time but will be making it long after I decide to eat a less restrictive low-carb diet. I used my rice/vegetable steamer to cook the cauliflower and used all ingredients listed plus about a tablespoon of butter. The garlic is what set these apart from restaurant versions. (didn't like Ruby Tuesday's nearly as much) Thanks for sharing, the leftovers will probably be my entire lunch tomorrow! Husband was shocked and loved, loved it! This is the best thing I have seen all day! Wow, I love it! Wow! This is pure genius - it looks so simple/easy to make, AND it's healthy for you! Plus, anything creamy is wonderful. :) Will definitely be making this tomorrow. Great recipe! To me it tastes like mashed potatoes! 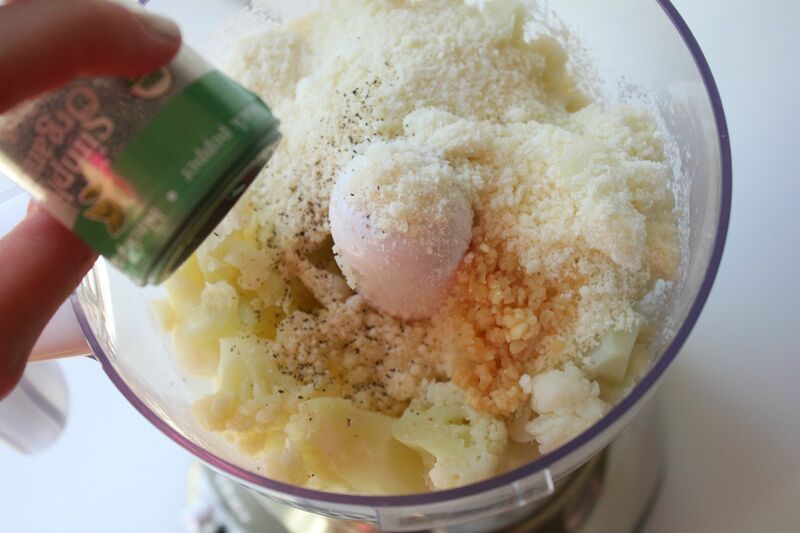 There's 1 T of cream cheese and 1/4 cup parmesan cheese for an entire head of cauliflower. Even if you ate the whole recipe by yourself, it would be in the neighborhood of 12-13 grams of fat. Ah! Never thought mashed potatoes can be made without potato. This is really innovative recipe. Kudos for the creativity. Just made it. These really are delish! Thanks for the simple recipe. Just made these last night, very good! The consistency is more like that of instant mashed potatoes, but if you eat them with a vegetable, you would barely tell the difference. Definitely helps with carb cravings! OMG These were Awesome. Only think I did different was use about a tablespoon of ranch dressing. (Didn't have creme cheese). Hint of cauliflower taste. My kids liked it better than mashed potatoes. My dr. said today I had to stay off potatoes. Perfect timing. Thanks for the excellent recipe. Awesome. My husband and I both loved this- and it's so easy! My boyfriend and I are having a mini-Thanksgiving dinner next Wednesday and I want to bring these (I think he'll love them!!) but he doesn't have a food processor and I'll be traveling 3 hours to see him, so I'm wondering if I can make these the night before and reheat them? Would they still be goo, or do they need to be fresh? You convinced me! Let's see if I get it passed the family with the same excitement I have. Thanks. 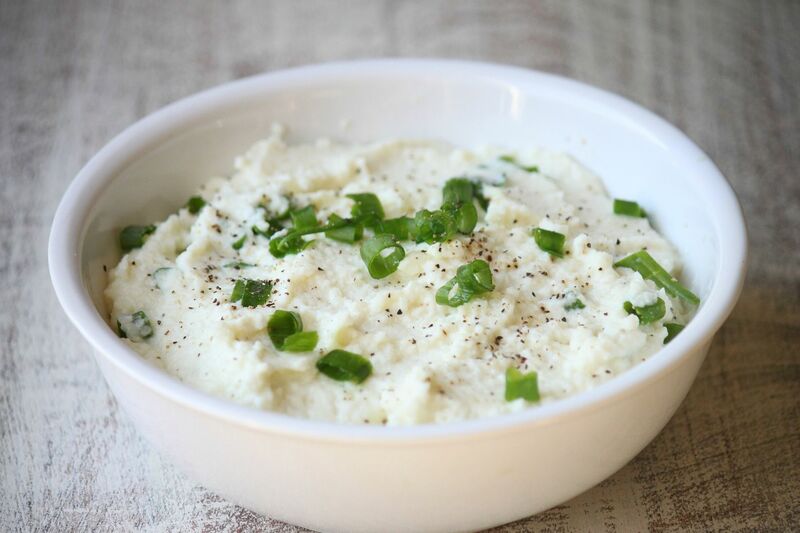 These are hands down the best mashed cauliflower I have made. I have tried several recipes. The cream cheese and food processor sealed the deal. I've always disliked cauli but I'm amazed how good this was, thank you so much, I've been converted! Great recipe! Thanks for posting! Love potatoes. Will surely try this! I'm not a big fan of cauliflower either but I love mashed potato so I'm tempted to give these a try.. Some people said that mashed potatoes is a traditional food. But I haven't tasted it. Actually I like cauliflower as one of ingredients cz it can defense the body from cancer. With that recipe I will try to make healthy food like that. Thanks about the recipe.